If there was ever a case of “too little, too late,” it would be Goosebumps, released by Sony Pictures Entertainment under its Columbia Pictures and Sony Pictures Animation labels. And, not unlike “The Simpsons Movie” in 2007, this picture should have come out at least 15 years earlier. “Carpe diem” or “strike when the iron is hot” are probably not very familiar terms to some Hollywood bigwigs, but what can we say . . .? If you were a child of the 1990s, or a parent of school-age children during that decade, however, you’re probably familiar with R.L. Stine’s Goosebumps, the best-selling series of kid-friendly horror novels that captured a generation of young readers, before J.K. Rowling’s Harry Potter fantasy series took them to even higher plateaus. Stine is still pumping out his tomes, but the white-hot intensity of those heady days is long past. That’s why this film, starring Jack Black and no one else, seems almost anachronistic. Back in 1998 there was some interest and even Tim Burton considered putting the horror story volumes on the big screen, but it never panned out, although there was also a short-lived TV series on the FOX Network. Now, with Rob Letterman (who worked with Black on the ridiculously stupid “Gulliver’s Travels” in 2010) at the helm and as if trying to make up for lost time with this franchise, crams it to the brim with monsters, gnomes, giant insects, werewolves, ventriloquist dummies and other assorted evil (but definitely non-frightening) entities that were part of Stine’s creepy collections over the years. These less than special effects draw clear distinctions between the much better work out there in films like “Jurassic World,” “The Martian” and “Everest,” among others that do not populate their pictures with ghosts and goblins and such. Plotwise, depressed teenager Zach Cooper (Dylan Minnette, “Alexander and the Terrible, Horrible, No Good, Very Bad Day”) and mother, Gale (Amy Ryan, “Bridge of Spies,” but better known as Michael Scott’s girlfriend on “The Office” TV series), move from New York to the small town of Madison, Delaware after his father passes away (OK, his depression is justified). His new neighbors are Hannah (Odeya Rush, “The Giver”) and her mysterious author father, Mr. Shivers (Black, who has not appeared credited in a feature film since 2011’s “The Big Year”), who tells him to stay away from his daughter (who can blame him?). At his new high school where Gale conveniently becomes the new vice-principal, Zach meets and befriends Champ (Ryan Lee, “White Rabbit”), a socially awkward student who is often bullied (and for good reason, too; he was so annoying that I wanted to take a few swings at him myself). One night, Zach hears Shivers and Hannah arguing from his window, followed by Hannah screaming. When he calls the police to investigate, Shivers assures the cops, officers Stevens (Timothy Simons, “Inherent Vice”) and Brooks (Amanda Lund, “Someone Marry Barry”), that the scream was from a movie. The officers lecture Zach about wasting the police’s time and leave (the audience should have taken their advice and followed their lead). Soon, though, suspicious of Shivers and fearing Hannah is in danger, Zach anonymously calls Shivers and pretends to be a police officer and tells him to come to the police station for further questioning. Zach and the useless Champ then break into Shivers’ house in search of Hannah. Only in movies are such banal plots gotten away with. They find several manuscripts from the Goosebumps book series — really?! — all of which are locked. For reasons unknown (except to further the plot) they unlock The Abominable Snowman of Pasadena, but are confronted by Hannah who assumes they are burglarizing the house. As Zach attempts to clear up the misunderstanding, he accidentally opens the unlocked book and of course, the Snowman emerges from it and breaks out of the house. In the ensuing chaos, the Night of the Living Dummy manuscript is accidentally unlocked as well. Zach, Champ, and Hannah pursue the Abominable Snowman to a local ice rink where it attacks them, but Shivers appears and manages to get it back into the book. On the way home, it is revealed that “Mr. Shivers” is actually R.L. Stine. He explains to the three kids that he created the books’ monsters when he was a child to cope with severe bullying. Meanwhile, Slappy the ventriloquist dummy (voice of Black, how inventive), is now free and is seeking revenge on his creator. Slappy then steals all the books and opens them all to free the monsters causing the biggest mishmash of overwhelmingly confusing CGI characters in cinematic history. It’s all very reminiscent of the town wrecking scenes in “Gremlins” and “Jumanji,” except it is nowhere near as good. 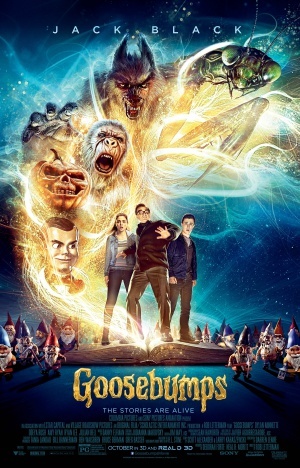 Goosebumps also seems to substitute frantic mayhem for even the most modest dialogue and story-telling, which is sad, even for a juvenile effort such as this. The Goosebumps screenplay follows this pattern, but certainly not to any satisfactory conclusion. Small children and/or die-hard fanatics of the author and his work may recognize some of the stories or creatures and be entertained here, but the rest of us will yawn, look at our watches and wonder when the next showing of “Steve Jobs” starts. It’s a horrible excuse to unleash Jack Black on audiences.